I’ve been using the same Christmas tree skirt for about thirty years. It’s been fine (since I try and cover it up with gifts) but was purchased quickly one Christmas and has had a lot of wear and tear over the years. Like the year our dog decided it would be better to pull it into the family room, thus came the tree with it. Pretty big mess and lost a few nice ornaments in the process! So I finally decided to make something more elegant and homemade that suits my decor right now. 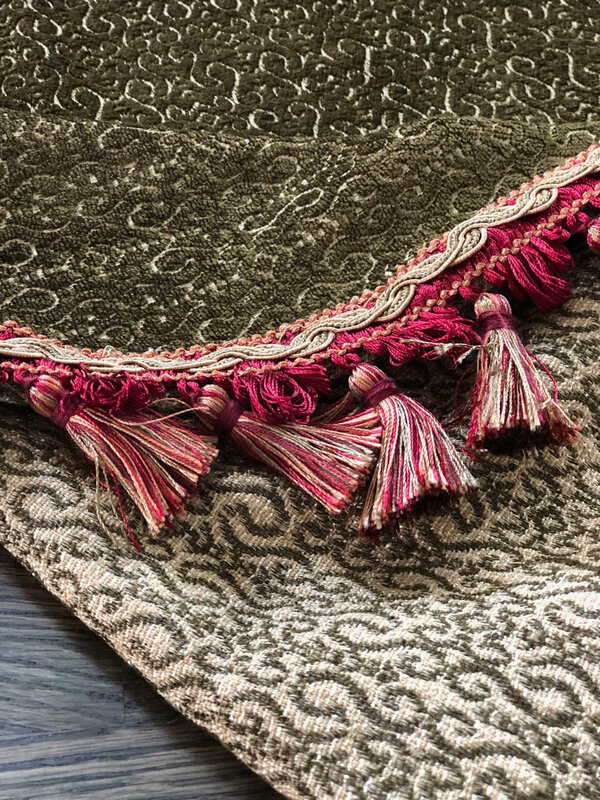 I used a heavy but amazing velvet upholstery fabric left over from another project and loved this choice both for it’s feel and the fact that I could make it reversible. I also decided I could make this easily with some upholstery trim I had left over from some pillows and throws that I’d made. This was going to be easy since I could either use my fabric glue to attach the trim, or sew it using my sewing machine. 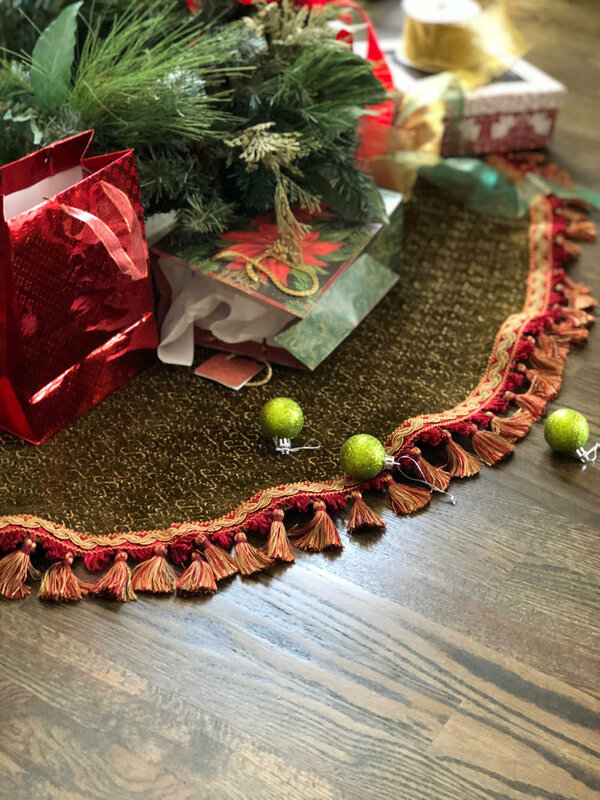 I did a little of both to demonstrate how easily you can make this tree skirt. As mentioned, I used heavy upholstery fabric that was reversible. If you can find something like this it makes this project so easy and pretty. If not, just use a heavy fabric and don’t worry about the reversible part of it. I just lucked out with my fabric! Note: My tree skirt was the perfect size for an 8’ tree like I usually have. If you have a very big or small tree, you can easily adjust the fabric and trim requirements. 1. Cut a 44” square from your fabric. 3. 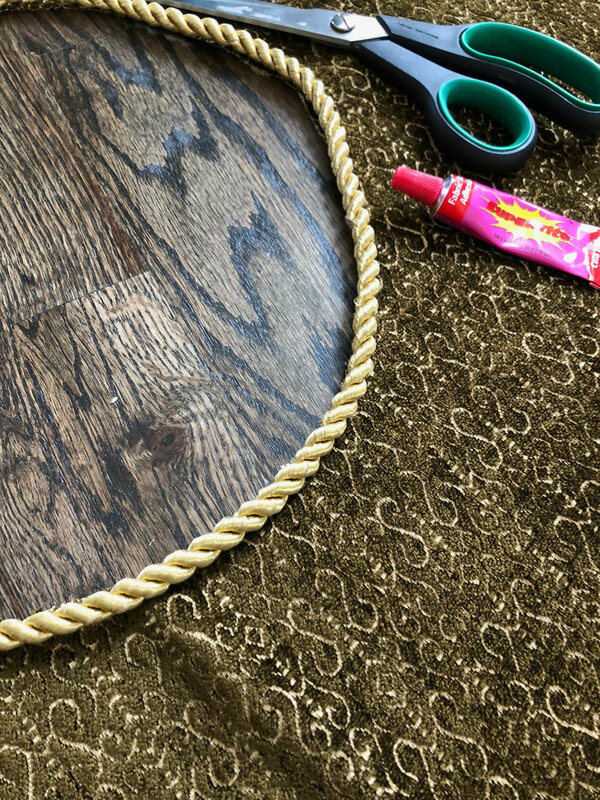 Use your measuring tape and a sharpie to make the circle for the tree skirt. For this I placed my measuring tape in the folded corner and marked as I moved the tape along the perimeter of the fabric square. Cut around the markings. This will make your circle. 5. If glueing trim with fabric glue, glue down this seam you’ve just ironed. Press firmly in place as you glue and let dry for at least an hour. Now it’s time to decide how you’d like for your trim to look from the front and back. Since I was using a reversible fabric, I tested how the attached trim would look from the front and back, depending on which side I attached it to. 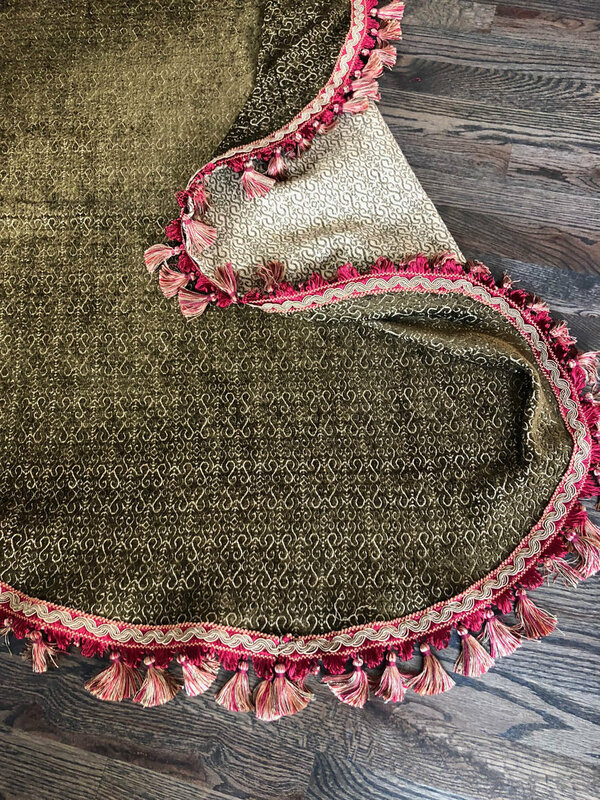 If you are using single sided fabric, place your trim and make sure you like how it looks with your fabric. 6. After you decide how to place your trim, use more fabric glue to further secure trim to perimeter of tree skirt. Optional: use your sewing machine to sew down trim. 7. Next, you’ll need to cut your circle for the opening in the center of your tree skirt. I found it useful to find a large plate as a template. Fold your tree skirt in half and position the plate directly in the middle of your folded tree skirt. Measure to make sure it is directly in the center of tree skirt. 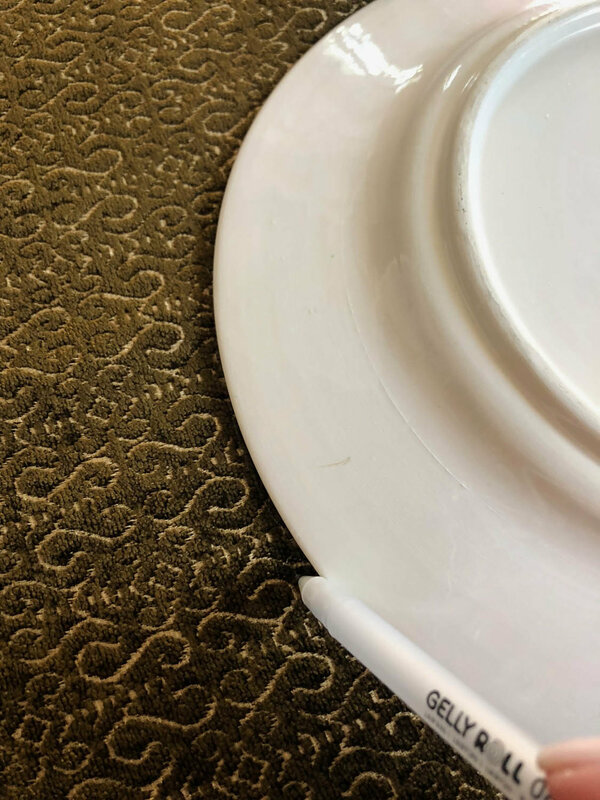 Trace the half circle onto your fabric. 8. You’ll need to finish off your circle with a trim of your choosing. I chose a cording and glued it down on both sides of my fabric, letting dry for an hour in between glueing. Depending on your finishing trim, you may be able to sew it down. Mine was too thick to sew. I absolutely love my new tree skirt and it really wasn’t hard to make at all. I’m so glad it’s done in plenty of time for the holidays! I’d love for you to share your holiday projects or memories with me! Feel free to comment below or send me an email!